It may surprise you to learn that the air in your home could be up to 70 times more polluted than the air outside! But think about it. Over the years, the forced air ducts in your home have been collecting dust and other debris. The environment inside these airways is dark and frequently damp, a perfect breeding ground for germs. In fact the Environmental Protective Agency (EPA) has documented pages and pages of biological contaminants that breed in air ducts and the health problems they can cause. Your home heating and cooling system is continuously forcing this "polluted" air into every room in your home. 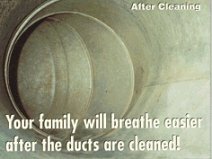 There is but one solution: Have your ducts cleaned and disinfected professionally at least every two or three years. A-1 Comfort Systems makes this invaluable service safe, efficient and affordable. Using state of the art equipment utilizing "HEPA" filtration, we'll clear your ducts of hazardous dust and debris leaving your home right down to the air you breathe, cleaner, fresher and safer! And of course, the service is GUARANTEED! If you don't notice the improvement in the air quality of your home within 60 days we'll refund your money without argument. 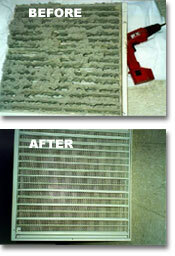 When we clean your ducts, we will also clean your cooling coil*, furnace blower and blower housing where accessable. 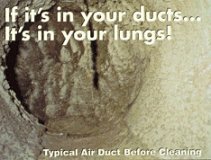 Make sure your duct cleaner is a licensed contractor as only a licensed contractor is allowed to perform these services. * Most coils can be cleaned in place, however on rare occasions the coil must be removed for proper cleaning. Your tecnician will advise you if your coil needs to be removed and quote you any additional charges with our upfront priceing.